Full-coverage competence in the OMNIplus ServiceNetwork. You move people as a travel company, your scope may even include the whole of Europe. This makes it especially important to know that strong service points specialised in buses and coaches are on your side, wherever you need them. We provide competence and reliability. Our network is constantly expanding. Our 24h SERVICE is available to assist you around the clock. 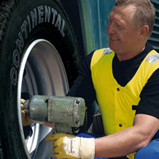 Tire service for virtually all of Europe – exclusively for OMNIplus ServiceCard holders. Get on the road without waiting. Another OMNIplus customer provides you with a bus or coach and driver with no hassle.